Praise the Lord!Sing to the Lord a new song, his praise in the assembly of the godly! But what about Jehovah God? Does He sing, too? According to Scripture, the answer is “yes”! 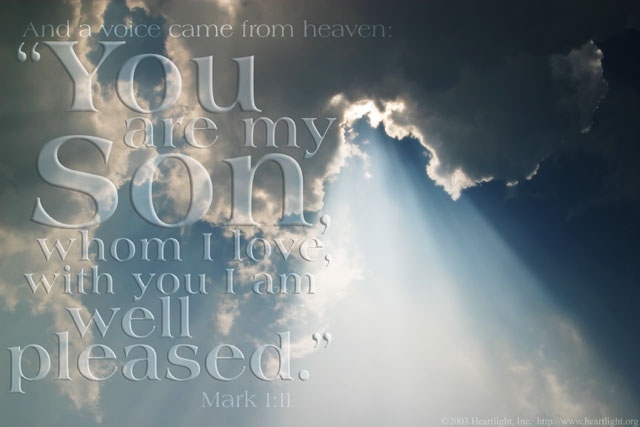 Let’s take a look at what else this verse says about our God. 2. 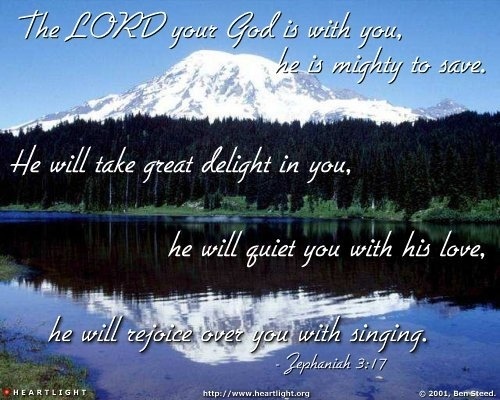 Jehovah God is mighty, and He uses that might to save us. In the future, at the last day, God will mightily judge the world. But now, in this age, His efforts are directed toward salvation. This is also why there is such rejoicing when a sinner repents. God and the angels literally have a celebration when someone is saved! It is important to have a balanced view of God. He is not looking for reasons to condemn, nor is He grudgingly granting salvation. Ours is a God of joy, who is ecstatic about His children, and is overjoyed at the spiritual birth of every one that comes to Him. Let’s make His day and seek out those in need of His salvation. And then we can rejoice along with Him! Have you ever wondered what it would have been like to sit and be taught by Christ in the flesh? How awesome it is that the Holy Spirit did as Jesus promised and brought to mind everything Jesus had taught them so they could pass those teachings to us in the New Testament! On the other hand, what kind of teachings would we hear if, instead of Christ, a deceiver who had gotten his teachings straight from demons tried to pass him or herself off as a messenger of God? What kind of things would they teach as doctrine? Thankfully, the Lord, through the apostle Paul, told us how to recognize demonic deception when we hear it! Paul here says what is at stake if we are deceived. It constitutes “departing from the faith” and we must be on our guard to make sure we don’t let it happen to us or those we love. But how do we recognize such teachers? How do we discern that someone is a liar with a seared conscience? By what they teach as doctrine. 1. They teach abstaining from marriage. This can apply to two different types of teaching. First and foremost in the history of the church is the teaching of celibacy. While some choose to remain single, to bind upon those who would be elders (bishops) a requirement of celibacy flies in the face of the qualification listed in 1 Timothy 3 and Titus 1 that they be the husband of one wife and rule their households well. But the other, contemporary application is those who teach that physical intimacy is permitted before marriage. They even recommend living together to see if couples are sexually compatible. By advising couples not to marry, they teach doctrine that Paul describes as demonic! 2. They teach that dietary laws are binding for today. Now please don’t misunderstand me. If you choose to follow a kosher, vegetarian or vegan diet for some health benefit, you are free to do so. You can even tell others how you think it is healthful to do so. But when anyone begins to advocate these dietary choices because it is a command of God, they have crossed over into the demonic. I know that sounds harsh, but don’t blame me. I’m not the one who wrote it! 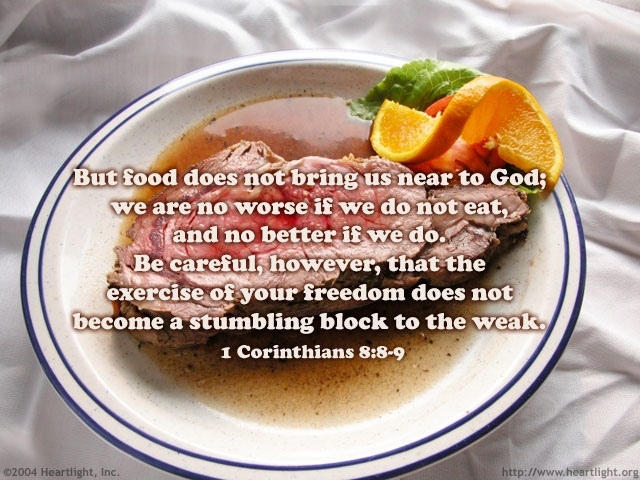 In fact, these verses loose us from all dietary restrictions, as long as we receive the food with thanksgiving, because God has said we can eat it, and we have prayed over it. What more reason do we need to pray before meals? But remember this is for those who know the truth. A weak brother or sister that would be made to stumble is more important than exercising our rights to eat whatever we are served! I would encourage you, if any of the demonic teachings described here sound like what you are being taught, to get out of there right away. Doctrines of demons are spiritually poisonous and lethal to your soul and your diet needs to change if you are to survive! Wouldn’t it be great to always know the right thing to do in any situation you encounter? To know that, no matter what else you do, that there is something that brings God on the scene for our good? Well there is just such a thing you can do. In fact, it’s never the wrong answer! Let’s let the Apostle Paul show us what it is. Both “pray” and “be on the alert” are participles in the Greek text. That means they are instrumental and connected with all the proceeding instructions. As such, they are not additional commands to do, but instead are the means through which the previous instructions are carried out. Without alert prayer, none of the things in the previous verses are possible! So if we are reading the prior verses about the armor of God and using the sword of the Spirit and asking ourselves how we are supposed to do all of this in a practical sense, then here is our answer in verse 18; pray and be alert. So when, in the present context, Paul says to pray in the Spirit, he is talking about how to wield the sword of the Spirit, the Word of God. There is something powerful about praying over the Word as we are reading and studying, and about using the Word of God in our prayers themselves! We can also see that the word “all” is used four times in this verse. ALL kinds of prayers and supplications are to be used: public prayers, private prayers, silent prayers, spoken prayers, long prayers, short prayers, intercessory prayers, prayers of thanksgiving, prayers of intercession, and every other kind! ALL seasons are the season of prayer: all times of the day, all conditions and circumstances, all occasions, all states of mind, etc. There is no time that it’s the wrong time to pray! ALL perseverance: through times of discouragement or defeat when it seems that all is lost, when victory has smiled or when it has failed …. let nothing hinder the prayer life. ALL the saints are to be remembered in prayer. What an intercessor was Paul. His letters abound with the word that he is praying for those whom he remembers and for those who will receive his letters. He considered it his spiritual obligation to continue in constant prayer for his brothers and sisters in Christ. It is hypocritical in many ways to ask others to pray for us if we are not willing to also be in prayer for them as well. Even though the Christian has put on the whole armor of God, he cannot win the victory except through a constant reliance upon prayer. A prayerless Christian is a contradiction of terms. When attacking an enemy, one of the first things that is taken out is the communications network. If you can cut off communication with their commanders, you render an army powerless to know how to fight. Satan has the same tactic. He wants us to cease communicating with the captain of our faith so that we become confused and powerless to recognize his tactics and resist him. Prayer is not glamorous. Prayer is something largely done in private. But prayer is the tool that God has chosen to use to accomplish his will on the earth. Do you want to see God active in every one of your life situations? Then never think for a moment, in any circumstance, that “all we can do is pray” because prayer is the best, most powerful thing you could be doing! Prayer — Just do it! 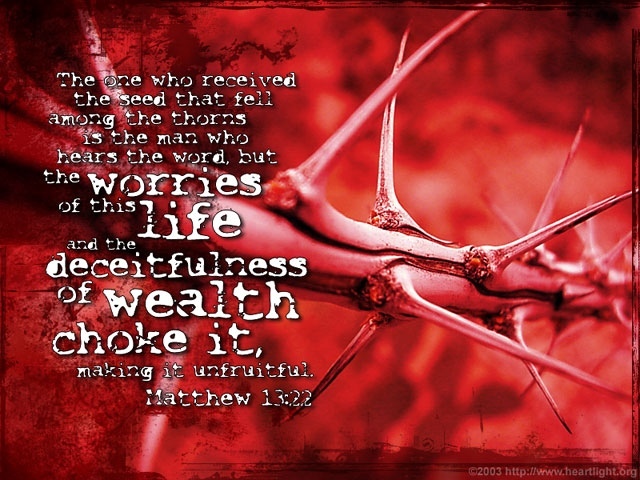 While this verse is fairly straightforward, I like how it is translated for the Amplified Bible. There are literally shelves full of books on how to do this. Of course the first one, by the Author of family relationships is the best. 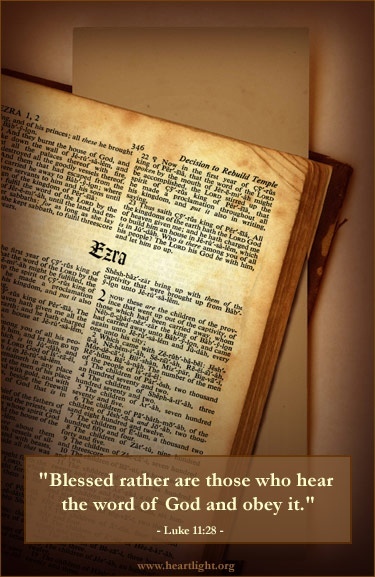 Look for a moment at Deuteronomy 6. The first part of these verses are called “The Shema” in Hebrew. THE SHEMA is the central prayer in the Jewish prayerbook (Siddur) and is often the first section of Scripture that a Jewish child learns. During its recitation in the synagogue, Orthodox Jews pronounce each word very carefully and cover their eyes with their right hand. Many Jews recite the Shema at least twice daily: once in the morning and once in the evening. Parts of the Shema are written on a small scroll which is then rolled up and put inside a mezuzah. Thus the literally put this on their door posts. But what about those who did not have the advantage of a Christian father? Is there provision for them? Yes! In the Old Testament book of Deuteronomy 3:27-28, Jehovah instructed Moses like this. 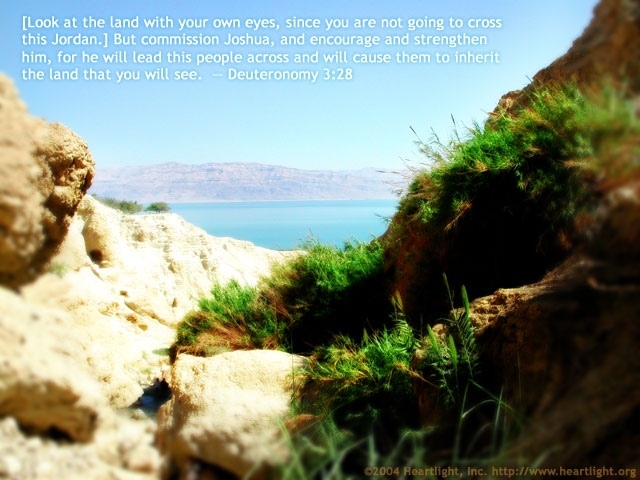 Look at the land with your own eyes, since you are not going to cross this Jordan. But commission Joshua, and encourage and strengthen him, for he will lead this people across and will cause them to inherit the land that you will see. I like the way Phil Ware from Heartlight describes what happened in his “Today’s Verse” devotional. May we make it our mission to come alongside those who have had no spiritual heritage and disciple them. As we help them to grow in the things of God, we will also reap an eternal benefit!